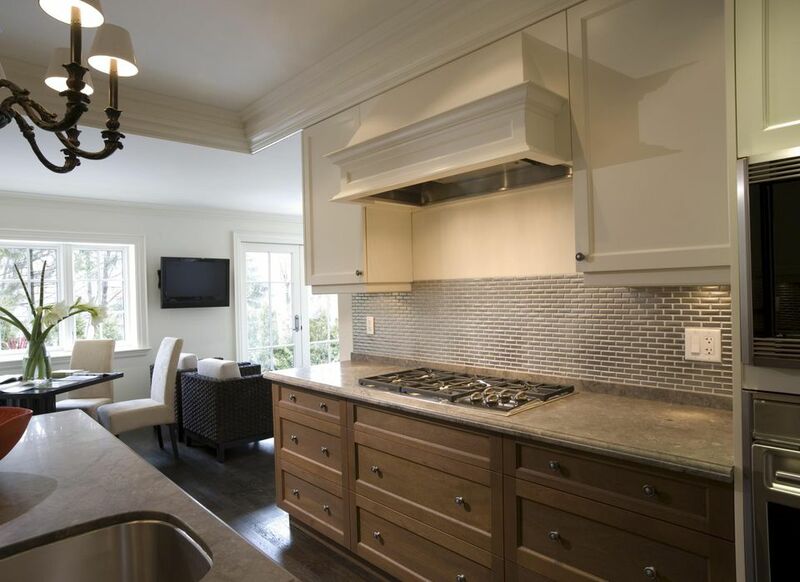 After years of being vilified, laminate countertops have surged back in popularity. There's no secret to this. At one time, laminates held a firm position as the manmade materials countertop of choice. But this position was challenged with the introduction of solid surfaces such as Corian. Later, another competitor came along: quartz countertops. The thinking among many homeowners was that they preferred a surface that was solid and homogeneous, a quality offered by both solid surface and quartz. Due to this stiff competition, laminate counter makers stepped up their game. Now this material, once a staple of ultra-low-budget remodels, is being found in higher-end homes. Major brand names in the laminate field are Formica, Wilsonart, Pionite, Bevella, Hartson-Kennedy, and Nevamar. They have responded with better embossing to more accurately represent a stone surface and with sharper, high-definition graphics. Will laminate find a place in yours? Demystify laminate countertops by looking at the manufacturing process, installation techniques, price ranges, and major manufacturers. Laminate came of age in the 1960s and 1970s, when plastic everything was the vogue. Certainly, laminate must be a modern plastic substance that is environmentally evil? Wrong. A familiar name to all of us, Formica, began operations in 1913 making industrial laminate products, and countertops as long ago as the late 1940s. Laminate is not plastic. Melamine Resin: This transparent top protects everything else below it. Overlay or Wear Layer: This layer is composed of paper similar to the paper used to make coffee filters or tea bags. Also, this layer carries some melamine resin and aluminum oxide with it. Decorative Layer: This is the layer that has the color and design. Kraft Paper: This bottom-most layer, similar to paper in grocery bags, is a kraft paper layer that forms the core of the laminate surface. This paper is hardened with resins. Unlike materials that are difficult to install, like slab granite or solid surface, the laminate can either be do-it-yourself-installed or professionally installed. You can purchase pre-fabricated laminate counters online or from home improvement stores. These counters have the laminate surface already applied to the base and with edge treatments added. Your range of looks is limited. Home improvement stores tend to only carry very few styles in stock, though you can special order other styles. To increase your style options the entire world of laminates, you can create laminate counters from scratch. Sheets of the laminate are glued to particleboard, with laminate forming the edges, too. A router rips off excess laminate and gives you a smooth, straight edge. Handling the router with laminate is tricky, as even the slightest nudge is enough to nick the laminate and ruin your edge. This option has a significant learning curve, and with many do-it-yourselfers, by the time they have learned the craft, their project is done. Rolled edge treatments are not possible with homeowner-created laminate counters. Your pool of sizes and styles is expanded to the maximum when you go through design house supply chains and have the countertops fabricated and installed by professional technicians. During installation, the installer first lays down the particleboard base, then applies your choice of the laminate surface with a strong adhesive. Excess laminate is routed off and edge treatments are added. Solid Surface vs. Laminate: If the laminate is ever confused with another countertop substance, it's usually what we call solid surface. Solid surface (Corian is one famous brand name) is solid all the way through, from top to bottom. Laminate is typically cheaper than the solid surface and somewhat easier to fabricate. One notable difference is that scratches can be sanded out of solid surface countertops. Laminate is difficult to repair, and sanding is not possible at all. Quartz or Natural Stone vs. Laminate: Stone can be either slab of natural stone or quartz (engineered stone made from stone particles bound by adhesives into slabs). In either case, the material is solid all the way through, unlike laminate with its particleboard base. Quartz and stone are vastly more expensive than laminate and both are difficult to fabricate and install. One downside of natural stone is that it needs to be regularly sealed. Tile vs. Laminate: Tile, either ceramic or stone, is a little like laminate in that it is a thin layer installed on a wood base. The difference is that tile's base will usually by plywood, whereas laminate's base is particleboard. Tile counters are comparable to laminate in cost. The main downside of tile counters is the huge number of seams. Between tile and laminate and with all other factors being equal, most homeowners would choose laminate. Tile is rarely the go-to choice in kitchen or bathroom countertops anymore. Laminate is still one of your cheapest countertop options. But with premium and designer laminates available, you do need to keep an eye on the price tag. Raw Laminate: Large sheets of laminate from home improvement stores are by far your cheapest laminate option. Remember that this does not include the slab base, baseboard, or peripheral materials, such as adhesives. Laminate Slabs: A decent laminate slab consisting of laminate on 1/2-inch particleboard, with a rolled front edge and attached backsplash, is about five times more expensive than laminate sheets alone. Like the laminate sheets, these can be purchased at most home centers. Pro-Installed: Professionally installed laminate counters are about ten times more expensive than buying laminate sheets and installing the countertops by yourself. If you want custom edge treatments, a time-intensive task that drives up the price, expect to pay even more. What Are the Best Countertop Materials? Are Formica Countertops Worth It? Corian vs. Granite, Which Counter Material Is Better? Are Cambria Countertops Better Than Zodiaq or Silestone? Which Laminate Countertops Are Best? Need a Sink Cutout in Solid Surface Counter? No Problem! Should You Choose Quartz or Laminate?